Celebrating the accomplishment, beauty and potential of women, Linda Ganstrom's art blends the refined realism of her porcelain sculpture with elements of ornamentation and storytelling. Steel skirts covered in tulle elevate the porcelain half-figures to a larger than life height. Elements such as these antique silver filigree butterflies add historical interest and symbolic meaning. Inspired by research into the lives of influential women, the sculptures hope to elevate women and inspire future achievement. Opening July 28, 2017 running through September 24, 2017, The Spiva Center for the Arts in Joplin, MO will host a large solo exhibition of over 20 ﻿figures. If you would like to connect, please contact me or check out my work on the web through galleries representing my work. 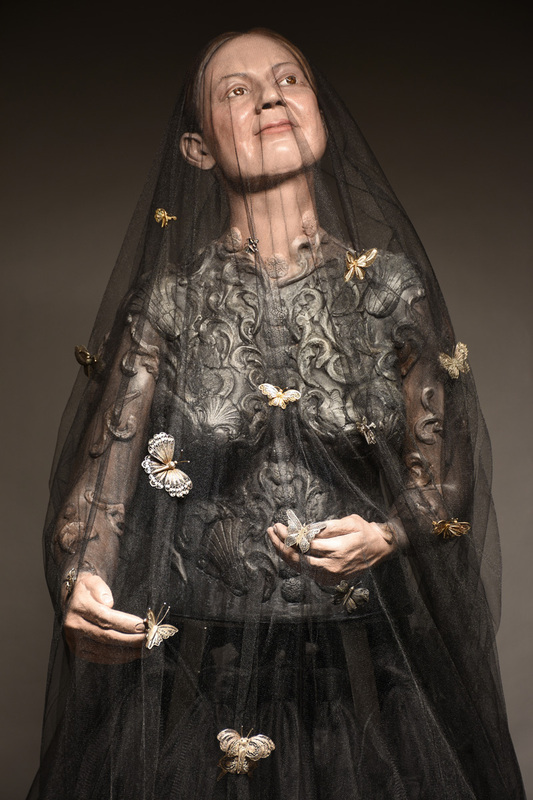 Better still, visit an exhibition and meet the remarkable women I sculpt. If you are interested in studying with me at Fort Hays State University, please contact me through my Fort Hays State University e-mail or phone. We offer both residency and low residency options for the MFA in Ceramics. Copyright 2017 Linda Ganstrom. All rights reserved.